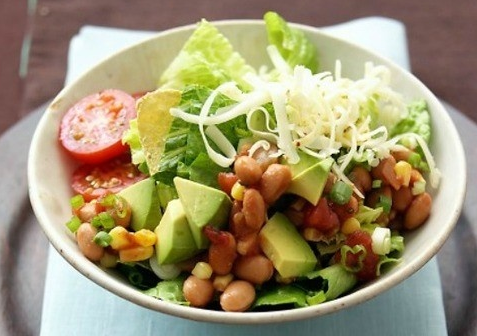 This summer, try these easy and delicious recipes for a low-calorie and low-fat meal! Here are some of my favorites. Take one slice of toast and load it with the spinach. Then, top it with tomatoes and avocados! Add some salt if you want, and you’ve got a part of a really delicious breakfast. Take the other slice of toast and top it with an egg, however you like them, and then add salt and pepper (or my favorite, Red Hot, which has no calories). Sounds simple, but it’s delicious. Take the pita round and top it with the tomato paste or sauce, if you prefer that. Add the spinach on top and feel free to add as much of that as you want! It’ll be crunchy, and it’ll give it more substance. Put the tomato on top, and be as generous as you want with that, too—the more the better. Finally, top it all off with some cottage cheese, and pop it in the microwave until it’s all gooey and delicious. Easy, quick and yummy! This is your salad for the day that is packed with fruits, vegetables and protein. With the veggies you like and sweetness of the fruits, you’re in for a treat! These meals are quick, easy to make and healthy! For easy and light meals to get you to go to the beach this summer, try these recipes and see how delicious they can be! Think outside the box with complementary and alternative medicine. Complementary and alternative medicine doesn't take the place of traditional medical care, but it can offer benefits to the patient during cancer treatment. Treating the patients mind, body and spirit during the cancer treatment process might work best for some patients. Thanks. Recommended measures for ensuring food safety include maintaining a clean preparation area with foods of different types kept separate, ensuring an adequate cooking temperature, and refrigerating foods promptly after cooking. Thanks.